Banana chips are a popular and delicious snack food. Not only are they crunchy, sweet, and rich in flavor, they are packed with fiber and potassium. 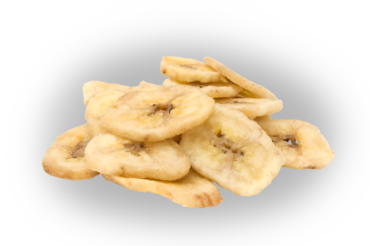 Our banana chips are found in trail mixes, fruit chip mixes, or eaten by the handful. Red River sources our chips from the Philippines, where there are approximately eighty different types of bananas. Our banana chips are produced mainly from the Saba variety, the leading banana cultivar in the country. How are banana chips made? Bananas are harvested when the skin is green. After they are washed and peeled, the fruit is sliced and fried in fresh coconut oil. The chips are then sorted by size and soaked in honey syrup and fried a second time. The result: a crispy, crunchy banana chip.